Hinduism is not just a faith. It is the union of reason and intuition that can’t be defined but is only to be experienced. Dr. S.Radhakrishnan. 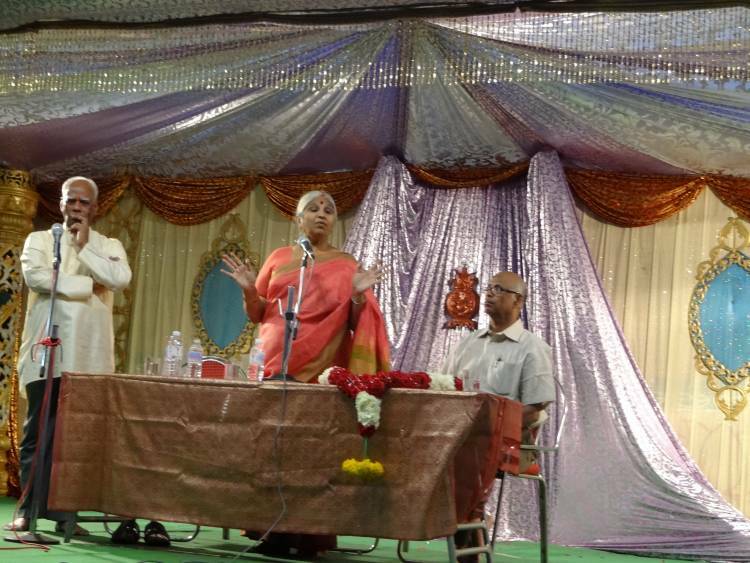 Global Hindu Heritage Foundation (GHHF) participated in a Seminar that dealt with the importance of preserving Sanatana Dharma and the plight of Hindu Temples and Hinduism. 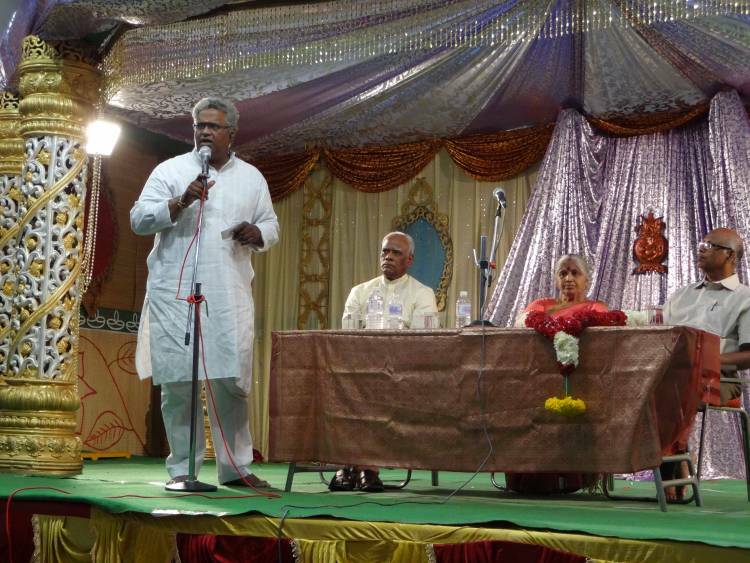 Dr. Rajendra and PrasunaGavini organized this program in Sri Padmavathi Kalyana Mantapam in Tenali on February 7, 2014. 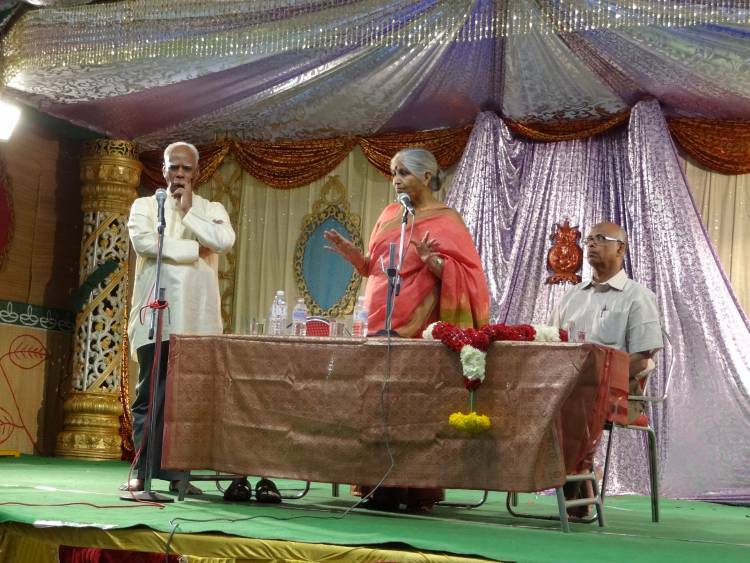 Ms. SatyavaniGottipati, asocial activist, who promotes the richness of Sanatana Dharma by her powerful speeches and Dr. Prakasarao Velagapudi, the President of GHHF,were invited to participate in this discussion. 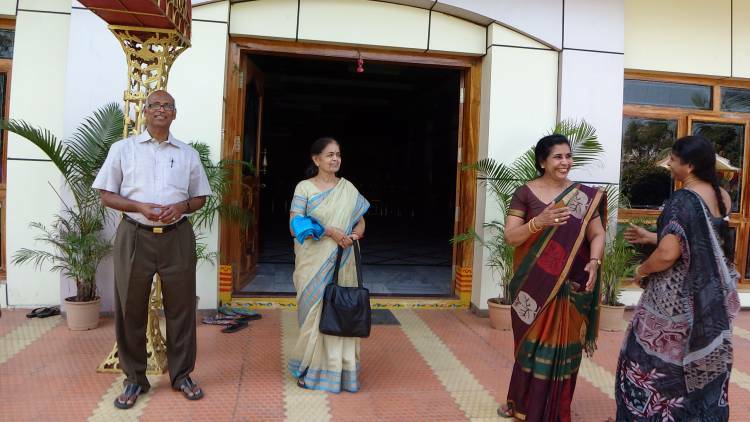 Prakasarao briefly traced the history of GHHF as to when and how GHHF was started, the kind of activities undertaken over the last eight years, and some of the milestones of the movement. He observed that the Andhra Pradesh government passed Hindu Charitable and Endowment Act whereby all the Hindu Temples making 50,000 rupees or more are brought under the government control with full control on the management of the funds donated by the devotees, supervision of the endowed lands of the Hindu Temples, conduct of all religious activities, overseeing the protection of jewelry, administering Hindu Temples and recruiting the employees to manage the operations of the Temples. The government has abused and looted the funds, diverted the funds to other religions, allowed Temple lands to be encroached with no recourses, neglected to oversee the preservation of jewelry and the integrity of Temples structures, allowed the Hindu Temples to be dilapidated, closed their eyes as the Rajagopurams and other structures collapsed, and permitted Labor Unions to be formed which fully exploited the Temple resources. GHHF has taken several steps to make Hindus aware of the plight of Hindu Temples and the potential danger to Hinduism due to the hateful attitude of the government toward Hindus in order to appease the minorities. The government takes advantage of tolerance, non-violence, broadmindedness and ignorance of Hindus to pass any laws that undermine the underlying unity of Hindus. Blinded by their party affiliation, Hindu politicians never even consider the future of their country. Their only obsession is to please the party bosses in order to satisfy their power and pockets. Many Hindu politicians would never even question as to why only Hindu Temples are taken over by the government but not the churches and mosques. 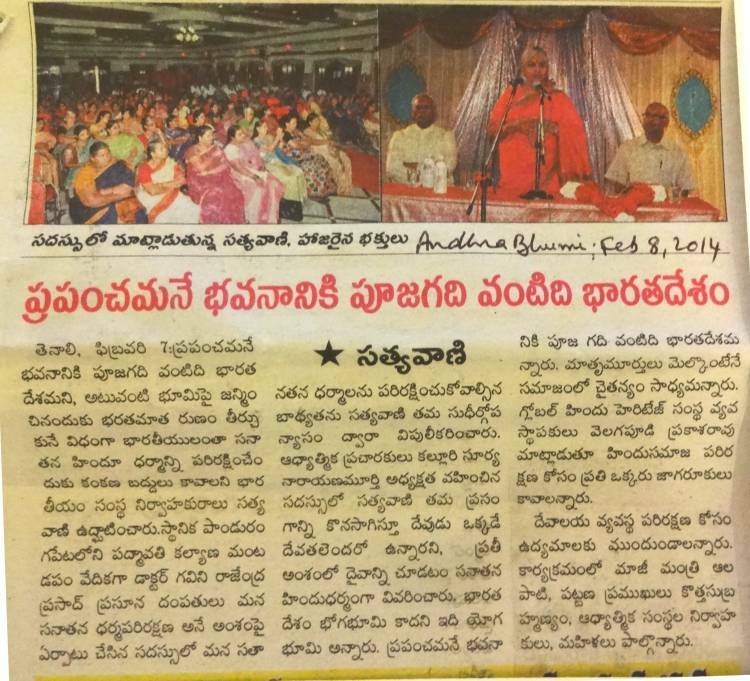 Why only Hindu Temple lands are used to start government programs such as Indiramma project to distribute the lands to the poor? 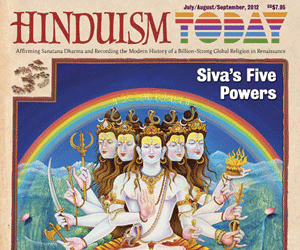 Three main points were discussed as to their implications for the survival of Hinduism and the fate of India. 1) Hindu Rashtra. India should declare itself to be a Hindu Rashtra giving special recognition and also accepting the preeminence of Hindu culture based on rich scriptures such as Vedas, Upanishad, Puranas, Darshans, Ramayana, Mahabharata and others. 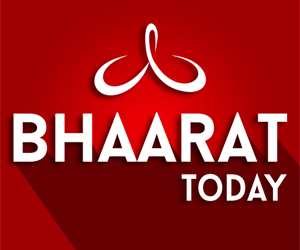 Principles such as “universal brotherhood,”“all humanity is one family,”“may all be happy and healthy,”“may there be peace among living and nonliving entities,” inclusive philosophy, and “live let live ideology” should form the rock solid foundation for Bharath. Any religion that advocates exclusive philosophy, condemns others to hell for not accepting their religion, seeks special privileges based on religion and destroys the places of worship of other religions should be subjected to sever punishment. All Hindus irrespective of their party affiliation and philosophical outlook should realize that there are 58 countries for Muslims to call them as their homelands; hundreds of countries in Europe, North America, South America, Australia, and other countries for Christians to call them as their countries; and Jewish people have Israel as their own country. It is only Hindus, with 1.2 billion populations across the globe, have no country to call it as their own country with their cultural background. The sooner we declare India as Hindu Rashtra, the better it would be for Hindus and every other religious group. Liberals, media, communists, Muslims, Christians and many other nations would make loud noises, criticize vehemently, denounce us as fundamentalists, condemn us as anti-Muslim and anti-Christian, and deprecate us as being undemocratic. The same people would not criticize, condemn, deprecate or criticize Muslims who depleted Hindus In Pakistan and brutalized Hindus in Bangladesh. The same people would not say even one word against Saudi Arabia for not allowing even a picture of Hindu God. They would not even open their mouth when Mullahs issue Fatwa to kill people who criticize Islam. Our failure to declare India, as Hindu Rashtra, would land us into the jaws of Islamic exclusive philosophy. It would become an Islamic Country in the next two-three decades as the Muslims increase their population with multiple wives and rampaging the country with terror, torture and killings. They will slowly deplete Hindu population from India the way have done in Pakistan and are doing in Bangladesh. Muslims have been advocating the break up of India into three Islamic Countries – Mughalisthan, Dalitisthan and Dravidisthan. Veer Savarakarsaid, “If you wish, O Hindus, to prosper as a great and glorious Hindu nation under the sun, and you well have a claim on it, that State must be established under the Hindu Flag. This dream would be realized during this or the coming generation. If it is not realized, I may be styled as a daydreamer, but if it comes true, I would stand forth as its prophet. I am bequeathing this legacy to you”. 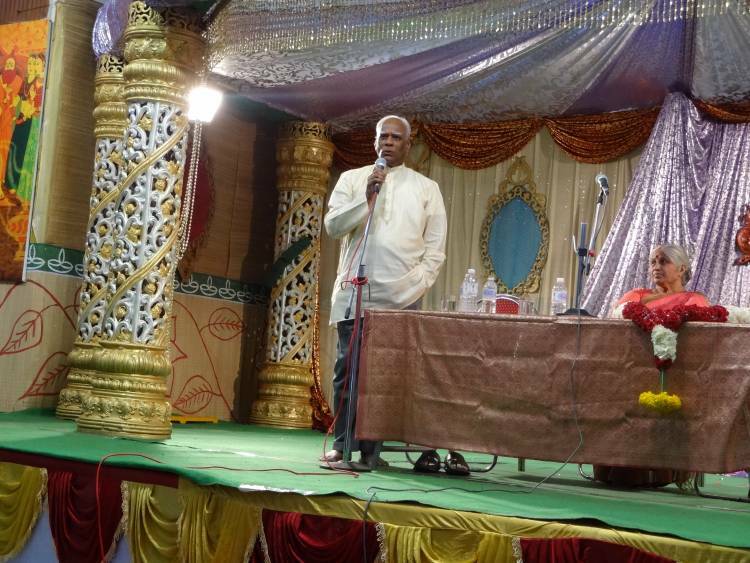 Dr. Babu Suseelan strongly advocates the reasons for declaring India as Hindu Rashtra as follows:"Hindus call our way of life as Santhan Dharma. Hindu Dharma promotes freedom, democracy, pluralism, and respect nature and wholeness of all living and non- living entities. Our great Rishis have developed different thought systems and means to achieve equanimity, patience, health, forgiveness, control of mind, purity of thought and action, peace, progress, development of the intellect, knowledge and transcendental living." 2) Hindu politicians and businessmen are the real enemies. Hindu MLAs and MPs, and Hindu businessmen are mortgaging the country for their money, fame and name. If we look at how many thousands of acres of Hindu Temple lands are sold by the government without the approval of the original donors, we will all be surprised. It is Hindu politicians, Hindu businessmen and Hindu donors to the political party who have bought the temple lands, encroached the temple lands, and approved the transfer of lands to the government and they never ever discussed the transfer of either Church lands or Mosque properties. In fact, Churches are India is believed to be the largest landowner next only to the government. Minority appeasement and vote bank politics are creating havoc in the lives and terror in the hearts of majority of the Hindus. It is sad to watch on TV stations and read in the newspapers as to how grateful the politicians are for their political wish being granted and how they are going to recognize Sonia Gandhi, who is a Christian, by constructing a Temple, although Christianity abhors image worship. Even, one of the TTD chairmen openly announced that he would be grateful all his life to Sonia Gandhi for selecting him for the post. This kind of slavish mentality is ruining the country and destroying the Hindu principles of freethinking, intelligence, freedom, independence and liberty. All these politicians are becoming bonded slaves to the party and mortgaging the motherland. 3) There is no real dialogue or open discussion taking place in the media about the role of Muslims in fomenting hatred toward Hindus, about the appeasement policies, reservation of educational seats, rampant terrorist activities, abuse of Hindu Temples and Deities, loud speakers blasting at high decibels, widespread use of houses as Churches in residential colonies and villages, failure of Police Department to file FIRs, the rampant abuse of Atrocities Act, and astronomical abuse of Dowry Act and so on. TV stations routinely ask the interviewers not to talk about other religions, their atrocities, their abuses, their outspoken hatred toward Hindus and their outright zeal to convert India into an Islamic country. No TV station will take the risk of Muslim rampage. Law and order in India is tilted toward the minority appeasement. In fact one TV executive even confessed that they have to apologize to Muslims by scrolling on the screen for one month for showing Muslims reading the Quran. Next one decade is crucial for the survival of Hindus in India. If the Hindus do not get united, shed their greed, challenge the laws that are undermining the very fabric of Hindutva,remove their shackles of political affiliations, question the appeasement policies, enforce uniform civil code, stop the deceptive conversion practices, control the population explosion, they will be ransacked, rampaged, terrorized and plundered. For Hindus, there would not be any place go, any place to hide, any place to run and any place to seek asylum. Let us be the true inheritors of the richest culture handed down by our ancient rishis for us to enjoy the freedom, democracy, pluralism, independence, and liberty. Hindus must wake up before they are wiped out and shoulder the responsibility of preserving their ancient Sanatana dharma. The Hindus have always kept their religion and politics separate. They never imposed their religion upon other religious people. They never invaded any other country to convert people of other religions to their religion. Hindus always welcomed all other religions, hosted them, sheltered them and protected them. They never killed them, tortured them, looted them, raped them, plundered them, and converted them. Let us remember the words of the former President of India, Dr. A P J Abdul Kalam: “In 3000 years of our history, people from all over the world have come and invaded us, captured our lands, conquered our minds. From Alexander onwards, The Greeks, the Turks, the Moguls, the Portuguese, the British, the French, the Dutch, all of them came and looted us, took over what was ours. Yet we have not done this to any other nation. We have not conquered anyone. We have not grabbed their land, their culture, their history and Tried to enforce our way of life on them. Why? Because we respect the freedom of others.” That is enough justification to declare India as Hindu Rashtra. Rajesh Veerapaneni (773-704-0405); Sunil T Patel (214-293-4740); Gopal Ponangi (214-868-7538); Ram Yalamanchili (214-663-6363); Ravi Pattisam (617-304-3577); Krishna Athota (214-912-3724); Sesharao Boddu (972-489-6949); P. Srinivas (832-444-6460); P. Viswanadham, PhD (972-355-7107); I V Rao (214-284-6227); Sridhar Kodela(214-907-8552); Vijay Kollapaneni (818-325-9576); Ghanashyam Kakadia (469-583-1682); R K Panditi (972-516-8325); Mahesh Rao Choppa (732-429-5217); Viswas Mudigonda (972-814-5961); Satish Reddy (972-724-3232); Srikanth Akula (952-334-9990); Kalyan Jarajapu (972-896-8352). 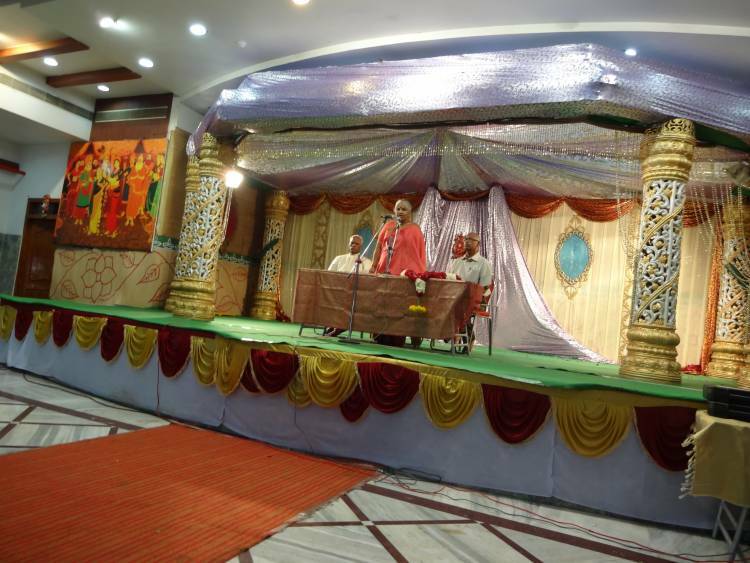 Sitaram Panchagnula(714-322-3430); Vasanth Suri(408-239-3436); Phani Aduri(214-774-2139); Konda Srikanth (214-500-5890); Siva Agnoor (214-542-661).